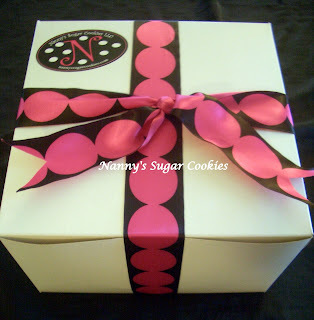 This is the Boxed Cookie Gift Assortment that I started offering last year. 10-12 themed cookies varying in size that are placed in a white bakery box tied with a satin ribbon and a Nanny's Sugar Cookie label. The inside of the box is lined with tissue paper and the individually wrapped cookies are placed between layers of "shredded paper"creating a cozy bed for the cookies.